Who Wants Legs Like Taylor Swift? With the weather heating up it’s time to turn our attention to one of the most neglected areas of our body; our legs. Maybe it’s because the papers are smothering us with pap shots of Taylor Swift out on the town with her new beau (Calvin Harris FYI) but we’re slightly obsessing over the singer’s legs at the moment. Yes, they’re long (granted) and she accentuates them with the teeniest shorts and skirts but it’s not only that; they’re toned, smooth and even. Who wouldn’t want legs like that? So, with the warmer weather in mind (and with our Taylor Swift soundtrack in the background) here’s how to get your own Swifty pins. Evidently, Taylor does a lot of exercise in order to keep her legs so shapely. If you’re so inclined book yourself in for a pilates class-or-two, but, add massage to your at-home efforts. It’s something none of us think to do but massaging your legs daily will work wonders. Massage helps the body to eliminate toxins, which is only ever a good thing when it comes to our legs. Ridding your legs of toxins will help to keep cellulite in check. If you use something nourishing, like an oil or a rich cream, your skin will feel the benefits of it too. Try Clarins Contour Body Treatment Oil, £40, if you fancy an oil. It contains pure plant extracts including geranium and marjoram to help toxins on their way and reduce water retention. 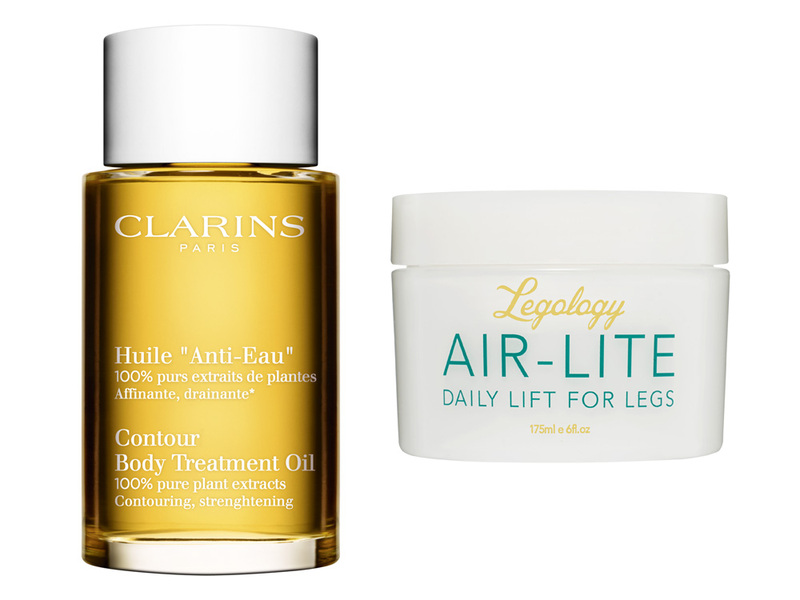 Another favourite is Legology Air-Lite Daily Lift for Legs, £60, it gives good ‘slip’ so it’s perfect for a massage, plus its citrusy concoction will help to boost lymphatic drainage and reduce puffiness. We love hydrating oils and creams as much as the next person but if your legs are feeling hot and weary and looking a little puffy then you really must try Aromatherapy Associates De-Stress Muscle Gel, £24. It’s instantly cooling and contains invigorating lavender, rosemary, black pepper and ginger. Naturally it’s great for preparing your legs for shorts or for relieving tired limbs after a hot day but we also love to use it when we’re flying. It’s a favourite. Exfoliation is probably one of the best things you can do for your legs if you want to drastically improve their appearance. You’ll make them smoother and more light reflective, which in turn makes your skin-tone appear more even. It’s an all round winner. Legology are launching Legology Exfo-Lite Stimulating Salts for Legs, £44 for 5 sachets, which combines sea salt and Himalayan pink salt which has detoxification properties and it’s a diuretic so it will help if you’re carrying any excess water around your ankles. It’s coarse and easily buffs away dry and dead skin. We also love Lancer The Method: Body Nourish, £48, which gently exfoliates skin with chemical exfoliators (rather than gritty physical scrubs) such as glycolic acid, which boosts cell turnover so you’ll shed the dead stuff quicker and reveal silky soft newness. It also contains hyaluronic acid and rich natural moisturisers to hit skin with a healthy dose of hydration too. It’s brilliant. If you just fancy a shot of moisture without the exfoliating action try ESPA Body Silk Spray, £28. It’s a dry oil spray that doesn’t feel greasy and leaves a beautiful sheen on the skin. The formula also uses Pomegranate and Chia which are rich in antioxidants so it’s perfect for misting over your legs after sun exposure. By Terry Tea to Tan Face and Body, £55, is a clever mix of hydrating water, skin care ingredients and a touch of pigment. It’s a very fine, refreshing mist and you really don’t need much just to add a hint of healthy colour to your skin (it works well over arms and décolleté too). On pale skin it brings a honeyed glow and on dark skin it adds a warm intensity. It’s really quite clever. Legology Sun-Lite Sheer Lingerie for Legs, £35, is a tinted jelly-like cream that evens skin tone. It’s not out yet but you can get your hands on it in a few weeks time. This Works Perfect Legs Skin Miracle, £37, contains vitamins C and E to even everything out plus arnica which will help to quickly fade any unsightly bruises. It’s not glamorous but hair removal plays a huge role in beautifying your legs. You may well be of the au-naturel persuasion and prefer to leave your leg hair as nature intended – and if that’s the case we salute you! But, if you do prefer to be fuzz-free then you don’t always have to resort to a razor. The No!No! PRO Gold Limited Edition, £210, uses Pulsed Thermicon technology which removes the hair with heat. It’s painless and easy to use, and because the treatment settings are adjustable you can use it on your bikini line and underarms too. Say goodbye to shaving rashes! If you like to wax away your unwanted hair at home (and who can blame you when a hot wax can cost around £50!) then you should try Nair’s new Argan Oil range. 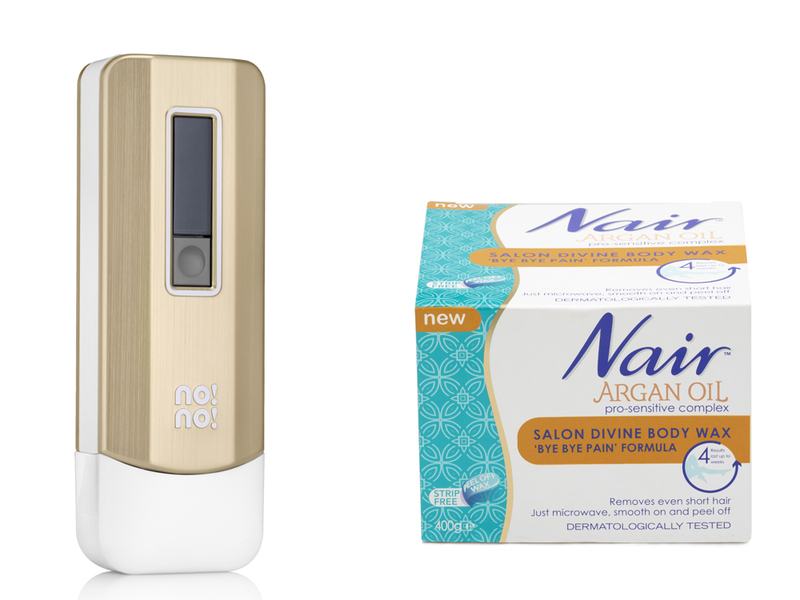 The Nair Argan Oil Salon Divine Body Wax with ‘Bye Bye Pain’ Formula, £11.99, makes the most of the softening benefits of Argan Oil plus there’s antioxidants, vitamin E and anti-inflammatory ingredients so you’ll be causing less stress to the skin.